Pirate's Jewelry - Why An Earring? Picture a pirate. I’ll bet you’re picturing a scruffy-looking person with a big treasure chest, an eye patch, and an earring. Why did pirates wear earrings, after all? Was it just to make a fashion statement, like many of us today? Actually, pirates wore earrings for more practical, and sometimes less practical, reasons. Pirates were very superstitious. They believed that precious metals like gold and silver had magical powers and could ward off bad omens and the evil eye. They even believed that wearing it in the ear could help with migraines, seasickness, and eyesight problems. Some even believed that it was impossible to drown while wearing an earring made of potent protective metals. While these superstitious beliefs might come as no surprise, the practical reason for wearing earrings while on the high seas came into play when pirates were in naval battles. In “Now You Know,” Doug Lennox writes, “Pirates, especially those who fired the ships’ cannons during close combat with the enemy, dangled wads of wax from their earrings to use as earplugs.” That’s a pretty ingenious use of jewelry. The gold, silver, and jewels that pirates weren’t wearing were kept in their coffers and treasure chests, much like how we store our jewelry. Of course, we’d rather keep our beautiful jewelry boxes on display than buried on a desert island. 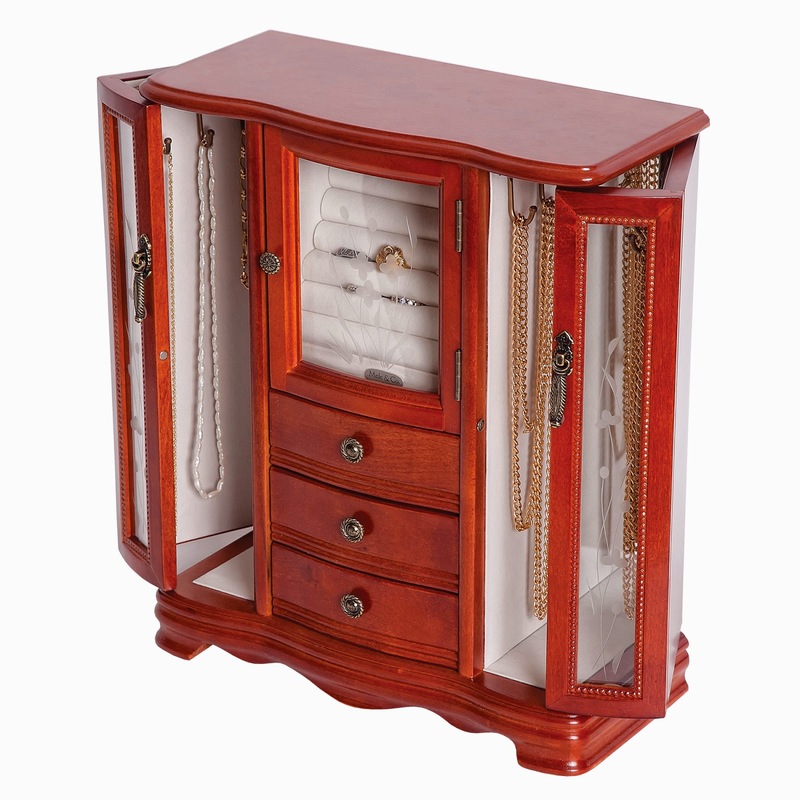 And here at ChasingTreasure, we offer all kinds of gorgeous jewelry boxes and armoires for your treasures! A Place to Store YOUR Treasures! The 1997 smash hit movie Titanic told the fictional love story of two people on board the Titanic. While the ship’s tragic fate was all too real, Rose and Jack never existed, and neither did Rose’s incredible necklace – the Heart of the Ocean: a blue diamond supposedly once owned by Louis XVI, cut into a heart shape after the French Revolution. The actual necklace plays a prominently role in the story, and captivated the audience with its imaginative beauty. So much so, in fact, that jewelers Asprey & Garrard were commissioned to bring the stunning jewels to life. The real necklace is a platinum-set, 171-carat heart-shaped sapphire. It’s surrounded by 103 diamonds and valued at an impressive $20 million. Celine Dion, the singer of the film’s famous ballad, “My Heart Will Go On,” wore it to the 1998 Academy Awards. Though the Heart of the Ocean necklace was inspired by a fictional tale, its popularity has put it among some of the most noteworthy and opulent jewels in recent memory. ChasingTreasure offers musical jewelry boxes that play “My Heart Will Go On” so you can be reminded of the romance every time you reach for your own favorites jewelry. Musical Jewelry Box - "My Heart Will Go On"
The egg has been viewed as representing richness and replenishment for thousands of years, with its form valued aesthetically. Consequently, it shows up in art and sculpture over the millennia. The most famous egg-inspired art is the Faberge egg of Russia. Peter Carl Faberge created sixty-five of these eggs starting in 1885 until the Russian Revolution in 1917. Fifty Imperial eggs were designed for Czars Alexander III & Nicholas II, and are the most luxurious. Alexander & Nicholas purchased them as gifts for their wives and mothers, with the first given as an Easter egg in to honor the 20th engagement anniversary. This first one is called the Hen Egg, and opens to expose a gold yolk, with the yolk opening to reveal a hen adorned in a replica of the imperial crown as well as hanging ruby pendant. This egg is currently owned by a Russian businessman, though the crown and ruby have been lost to history. These artistic pieces created by Peter Faberge were trinket boxes designed to hold opulent jewels: a gift within a gift! You can read more about the Faberge eggs here. You can also view ChasingTreasure’s collection of Faberge inspired jewelry boxes, many of which also play music. If you’re looking for a unique Mother’s Day gift for the women who also likes jewelry, these could just the right treasure! Musical Egg Trinket Box Plays "Swan Lake"
Jewelry cases are portable jewelry boxes perfect for the avid traveler. ChasingTreasure offers a variety of exquisitely crafted portable jewelry cases, complete with dividers, pockets, and drawers for secure organization. Portable jewelry cases make a thoughtful gift for the traveler in your life! 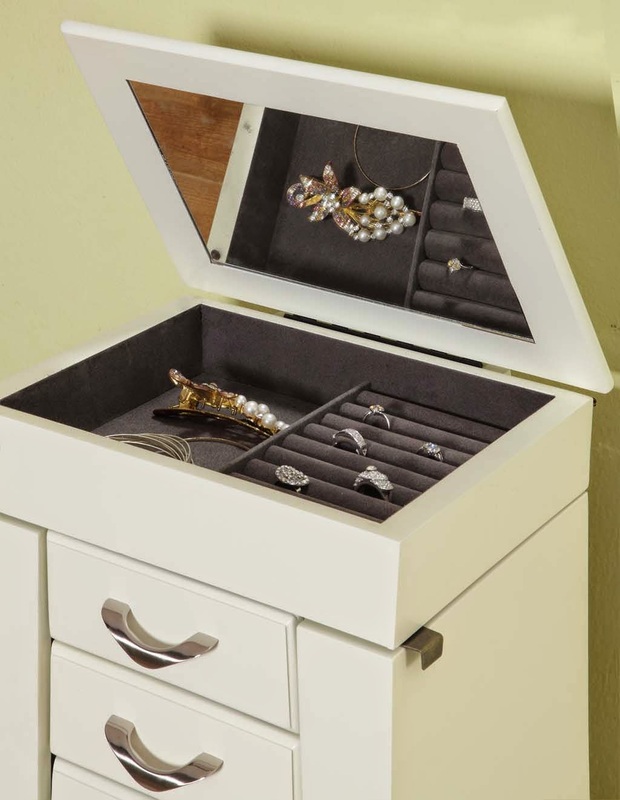 Let’s think about what you might look for when choosing a portable jewelry case for yourself or a loved one. Portable jewelry cases are elegant storage systems for your jewelry and accessories whether you’re on the road or at home. In fact, ChasingTreasure offers luxury portable jewelry cases that are so well-designed, they can double as your jewelry box on your dressing table. Travel jewelry cases from trusted brands like Morelle, Wolf Designs, Royce, Budd Leather, RaGar, and Reed & Barton offer a durable and stylish way to keep your collection organized no matter where you are. They’re available in many colors and finishes, including crocodile finish, ebony, white, red, and brown colors. Large train cases, with many drawers and compartments, are ideal for big collections and long journeys. Many styles offered by ChasingTreasure lock, meaning you’ll have peace of mind as you travel with your precious jewelry and accessories. Whether you travel with your entire collection or you’d like to keep all your and your family’s accessories in one place, large portable jewelry cases from ChasingTreasure are the perfect solution. If your travel can’t accommodate a large train case, ChasingTreasure offers smaller jewelry cases that can fit in your luggage. These smaller cases still come with all of the organizational compartments to keep your jewelry collection neat and tidy. Sturdy cases with clasps have lined drawers and compartments perfect for rings, bracelets, watches, earrings, and necklaces. Many include ring rolls, keeping your precious stones safe and in place. Removable trays offer even more storage to help you stay organized on your trip. Available in many colors and finishes, you’re sure to find a portable jewelry case that will complement your luggage at ChasingTreasure. Of course, some travelers need to really make the most of their space without sacrificing bringing their accessories. Soft-sided rolling jewelry cases have zippered compartments and take up even less space than the small jewelry cases. Travel clutches are jewelry cases that look like stylish purses in leather look material, bright colors, or glittery sequins. They slide easily into carry-on suitcases, briefcases, or purses, meaning you can keep your collection on your person and know that it is always safe! While many Hollywood starlets adorn themselves in breathtaking jewelry pieces, few reach the level of jewelry connoisseur and collector like Elizabeth Taylor did. Famous for her incredible acting talent, humanitarian work, striking features, and love affairs, she was also known for her jewelry collection, which contained some of the most valuable jewels in the world. She even wrote a book about her collection called My Love Affair With Jewelry. At the time of her death, her collection was worth a reported $150 million. It included many gifts from one of her husbands, Richard Burton, including some historically significant pieces. For example, as a Valentine’s Day gift, Burton gave her one of the most famous pearls in the world, La Peregrina. It was formerly owned by Mary I of England! Burton gave her the 33.19-carat Krupp Diamond (now known as the Elizabeth Taylor Diamond) which she wore almost every day, as well as the 69.42-carat Taylor-Burton Diamond. Taylor’s collection also included the exquisite Grand Duchess of Russia emeralds and the Duchess of Windsor diamond brooch. It might be unsurprising to learn that Taylor stored these impressive pieces in an entire room of their own. You might not have the space for an entire jewelry room, but your collection is just as important as Taylor’s was to her. 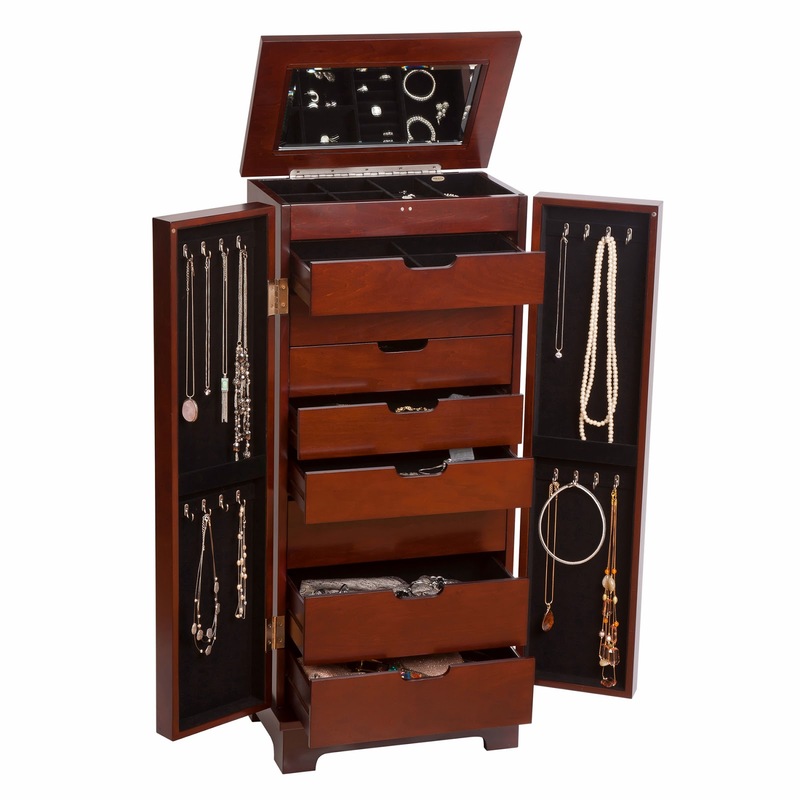 You can keep yours safe and organized with a luxury jewelry box or case from ChasingTreasure. In 2005, the jewelry trend that swept the globe was surprising to say the least. 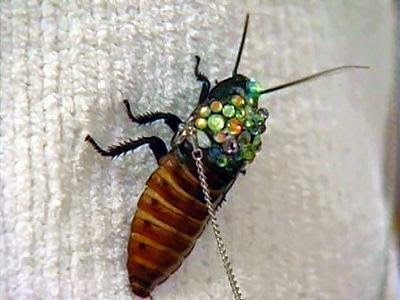 Bejeweled Madagascar Hissing Cockroach brooches were highly sought-after by celebrities and everyday fashionistas alike. The most surprising thing about these Swarovski crystal encrusted bugs? They were still alive when you wore them! They came with a little “leash” so that they would stay put. Salt Lake City fashion designer Jared Gold wanted his fashion line to stand out, and he was successful! They retailed for $60-$80 dollars and could be shipped overnight. Gold explains that the roach brooches enjoyed the warmth of their wearer’s body and looked best with light clothing. The cockroach brooches came with instructions for care and typically lived a year when taken care of properly with water, fruit, and a clean aquarium. It was like having jewelry and a pet in one. This piece of unique jewelry had a very specific jewelry box – its aquarium. But we’re certain your jewelry will be happy in more traditional jewelry box or case! One of the most famous jewelry boxes in history belonged to one of the most notoriously decadent people to ever live -- Marie Antoinette. The French Dauphine received her famous jewelry box as an early wedding present from her fiancé, Louis XV, when she arrived at the palace of Versailles. He had it specially made for her and its entirely-French materials were a symbol of the Austrian-born royal's new nationality. It included the jewels from past Dauphines, as Marie Antoinette had inherited them all. She would adorn herself with the storied jewels from her predecessors, but she had a taste for new custom-made jewelry, too. Her lavish style befitted the jewelry case, which was large and intricately designed even by royal standards. Its wooden doors were trimmed with bronze and inlaid with porcelain, and decorated with incredible hand-painted designs. As much of a status symbol as the jewelry it protected, the case still stands at Versailles today, delighting tourists with its opulence. You don't have to be French royalty to have a jewelry box as beautiful as your jewelry, though. ChasingTreasure offers beautiful cases of all sizes and styles -- fit for YOUR queen.